Cream manufacturing plants and Ointment manufacturing plants are manufactured from S.S. 316 grade stainless steel sheets and are cGMP compliant construction. The vessels are Jacketed, insulated, cladded and with suitable agitator assembly in each vessel. Wax is melted in Wax melting vessel, Water is heated in water heating vessel. Both wax and water are transferred into the manufacturing vessel automatically through vacuum. In manufacturing vessel both wax and water are homogenized to make a uniform emulsion and cooled by passing chilled water into the jacket of manufacturing vessel. After the emulsion is formed active ingredients / colors etc are added and are thoroughly mixed & homogenized. Later necessary perfume is added in case of cosmetics or wherever necessary. Ointment / Cream is ready. The same is transferred by bump pump into the storage vessel. & from the storage vessel it is automatically transferred into the filling machine by means of metering pump. Flow rate of Metering pump can be set as per your tube filling machines speed and capacity. Normally these are cylindrical vessels with either hemispherical or dished bottom vessels with loose type top lids. In some cases the top is also sealed by dished ends if clients demand for the same. Vessel are jacketed with either steam or electric heating as per clients requirements. Propeller type agitator is provided from the top and driven by suitable HP motor as per the vessel capacity. Bottom entry agitator are provided for closed type vessels. Wax is heated in the vessel bet 60 – 80’c as process demands and melted. This melted wax is later transferred into the manufacturing vessel. The vessel has a outlet valve fitted with din fittings for connection of suitable pipeline. A 100 mesh conical filter is provided for filteration of wax of any impurities. Normally these are cylindrical vessels with either hemispherical or dished bottom vessels with loose type top lids. In some cases the top is also sealed by dished ends if clients demand for the same. Vessel are jacketed with either steam or electric heating as per clients requirements. Propeller type agitator is provided from the top and driven by suitable HP motor as per the vessel capacity. Bottom entry agitator are provided for closed type vessels. Water is heated in the vessel bet 60 – 80’c as process demands and melted. This heated water is later transferred into the manufacturing vessel. The vessel has a outlet valve fitted with din fittings for connection of suitable pipeline. A 100 mesh conical filter is provided for filteration of water of any impurities. Manufacturing vessel is cylindrical vessels with either hemispherical or dished bottom vessels. Top of the vessel is also dished end. Silicon gasket is provided between vessel and top lid. Agitator assembly in the manufacturing vessel., Bottom entry Homogenizer & Top Dual speed anchor agitator is provided in the manufacturing vessel. Hydraulic lifting of the top lid is provided in manufacturing vessel for cleaning. Suitable nozzles, manholes, valves etc are provided in all the vessels. Vessel is also provided with jacket which can be used for both heating and cooling. However in manufacturing vessel mainly cooling is done. Manufacturing vessel can be subjected to full vacuum. Metering pump is also specially designed pump which is also commonly called as positive displacement pump. 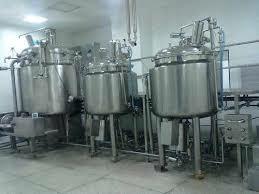 It is used to transfer ointment/ cream from the storage vessel to the filling machine hopper. There is a setting wheel in the metering pump wherein you can set the transfer rate as per the speed and capacity of your filling machine this prevents overflowing of the hopper and also complete automatic transfer. This pump is also has S..S 316 contact parts. Vacuum pump of suitable capacity is normally in clients scope or otherwise as specified. This pump is kept in utility section and the connection is done in the main vessel to the pump. The operation of this pump is provided in the control panel. Interconnecting pipeline is provided for the plant as per the layout of the clients room size. All pipelines are electro polished from inside and outside. All joints are DIN standards quick open able types. All vessels have CIP/ SIP nozzles & conical filters are provided at the discharge of the vessels. Entire plant is fully automatic and interconnected by suitable pipeline & requires only one operator for all the operations. Suitable working platform is provided for cleaning and maintenance. An integrated control panel fully automatic controlled by a PLC is provided. Inline homogenizers are also provided for specific applications or where height constraints are there. Working platform made out of S.S. 304 is also provided for ease in working/ cleaning / operations etc. Also in between sizes such as 150 kgs , 250 kgs etc also available as per clients individual requirements.